Monitoring employees heading in and out of an organisation is always a great concern of any security software. Head on to any security control room and you will find that one of the permanent features of this room would be multiple LCD monitors installed inside along with security officers assigned to keep an eye to their screen. 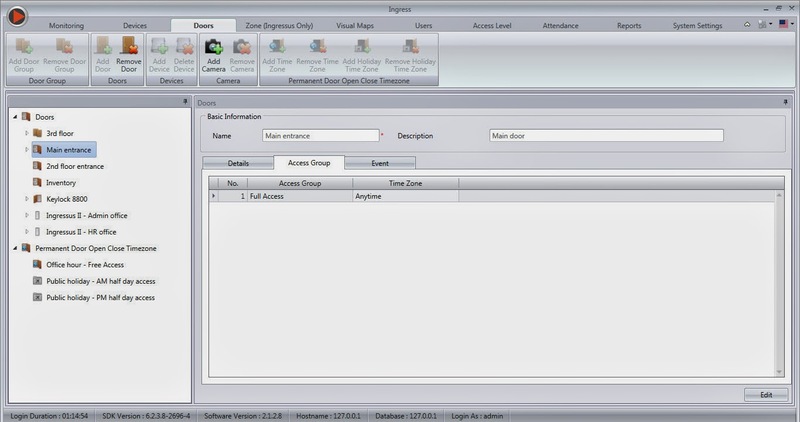 These screens are used to track and monitor incidents such as who has just entered or exited the premise, the door’s status, status of the devices and more. In some companies, IP cameras are installed to monitor each door’s activity. Normally there is an NVR software (network video recorder) which function is to record the video captured by the IP camera. Security officers need to operate the NVR software in case of playback and monitoring. You can use Ingress software as an all-encompassing access control monitoring platform. 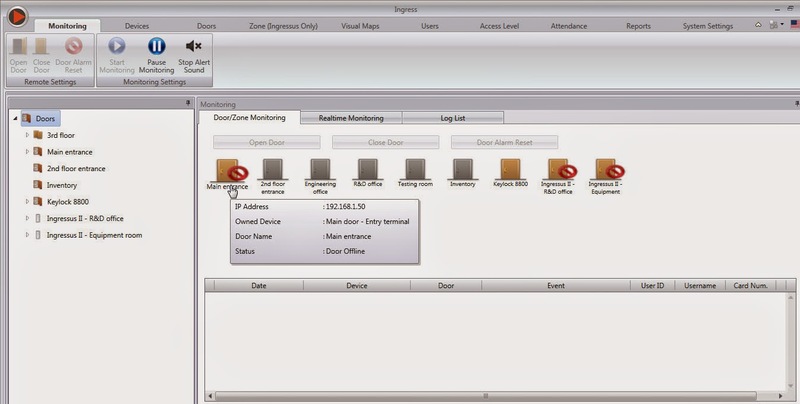 In order to setup the monitor, first of all, you must connect to all FingerTec devices that is listed under the Device page. Next, you must pair the devices with the door accordingly under the Door page. You will have a clear view of the available doors and devices. Choose a door to setup. You will then be able to see the complete list of locations that you wish to track under the monitoring view under Monitoring page. In the case of special events such as the door is opened by force or the door is not closed properly, Ingress will display the records with a different color to attract the security officer’s attention. 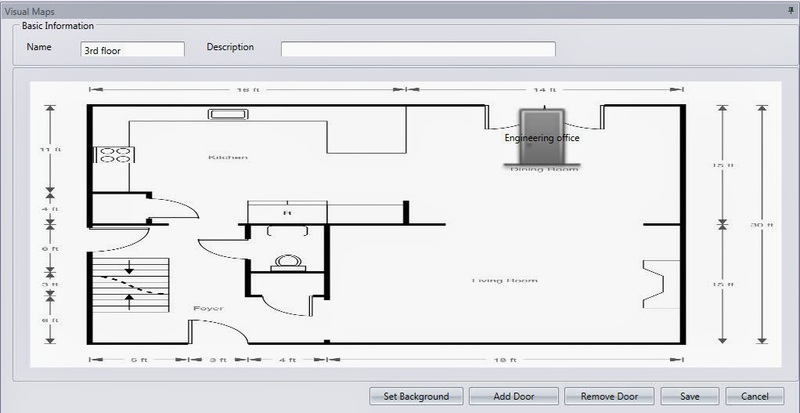 You can setup the monitoring function by using floor map to get a better overview. 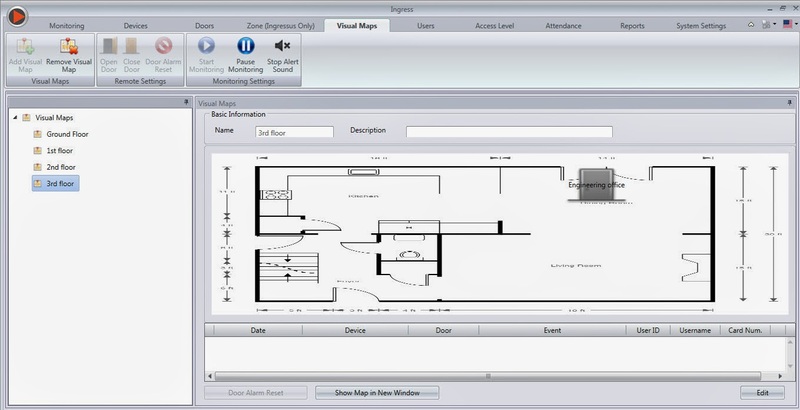 Select the floor maps and insert it into the Ingress software under the Visual Map page. You can drag and drop the doors to the maps accordingly. You can setup multiple floor maps and view them in individual windows. This action is best applied for those who have multiple LCD display monitors. Customers will always demand real time visual monitoring at every spot or entrance/exit. As a result, they will usually install an IP camera and link it up with their NVR software. You can use Ingress to link up with the Milestone NVR software to get live video streaming and playback. This will be useful to security officers as they will no longer need to operate 2 different software when they are on duty. 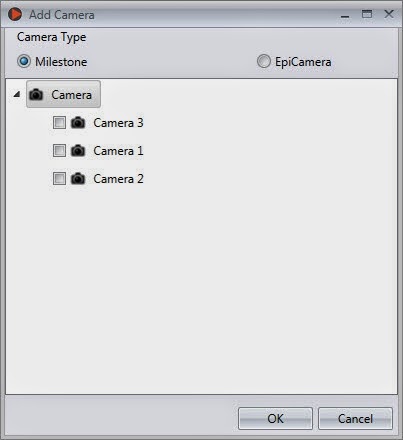 You can pair the IP camera (listed in your Milestone server) to doors under Door page. In addition to that, you can now stream the live video from the IP camera during monitoring. The video can be exported into other forms of digital format and it can then be send to other parties for further viewing and investigation. is there anyone who can support me in preventing some users from accessing during a specific time? But please make sure you are using the latest Ingress software, so that all the function that you update from the software will be updated to the device without any problem.